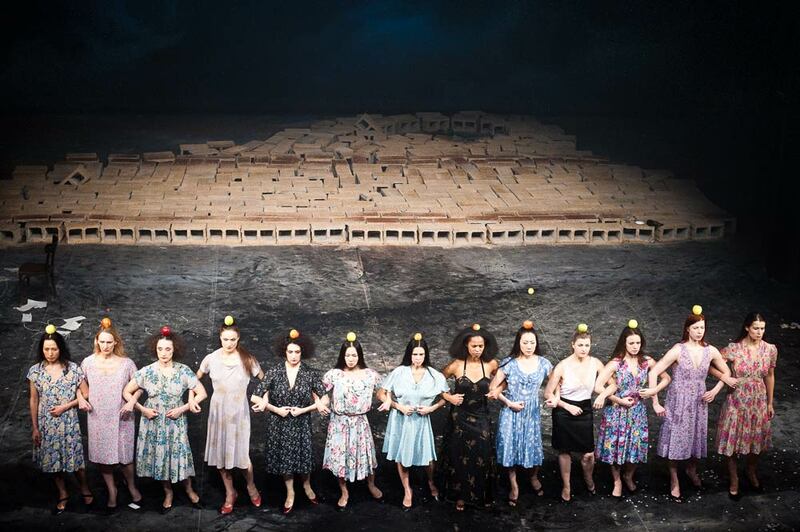 Tanztheater Wuppertal Pina Bausch in Palermo Palermo. 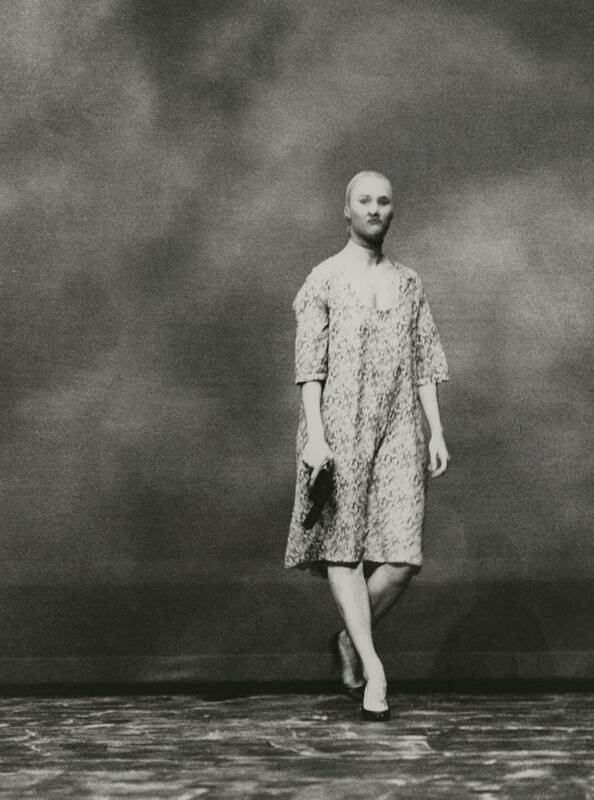 Pina Bausch’s particular brand of dance theatre owns many characteristics that are reiterated again and again throughout her work. The balance of these motifs changed over the years but the act of breaching the fourth wall is generally present. The Wuppertal ensemble regularly deconstructs the conventional relationship between performers and audience by inviting spectators to become a small part of the show. It might be to seek a response to an innocuous question, offer a drink, take a photo or anything similarly inoffensive. In Palermo Palermo Bausch takes the demolition of the fourth wall to its literal extreme. The show opens with a construction of breeze blocks built across the portal. As the audience stares at the grey wall, it slowly topples backwards, crashing to the floor and sending a thin haze of dust to hover above the auditorium. For a few moments, it seems as if we are sporting a collective halo. For the next three hours, save for a small strip at front of stage, the performers have to negotiate their way through a field of broken masonry, often in bare feet. It’s a wonder that in these rigorous days of ‘elf & safety that this performance is allowed at all; but thankfully tanztheater seems to have immunity from the inspectors. Julie Shanahan and Dominique Mercy in Palermo Palermo. Some have suggested that the year of this work’s creation (1989) means that pulling down the wall has a symbolic significance for German reunification but I believe this to be just a remarkable coincidence. Since Palermo Palermo was the first new work to be made by Bausch after a two-year hiatus, I think she just wanted to come back with a bang. It is certainly one of the most potent opening images in the whole of dance theatre; and one that is definitively hard to top without dynamite. A considered analysis of the hundreds of events that occupy this performance casts light on just as many references to southern Italy. There are the obvious, ranging from Cristiana Morganti declaring that the spaghetti in her hands is all hers, not to be loaned or shared with anyone (later Dominique Mercy tries to stab himself with sticks of the stuff); to oily gigolos in trench coats rubbing lemon juice through their hair; and then there are the musical influences from Paganini to an addictive Sicilian fishermen’s song. Others are more subtle. The Neapolitian tendency to hypochondria; a disregard for litter; the fascination with food, fashion, sharks and a constant quest for romance; and the ritual of the passeggiata, the social obsession with early evening walks going nowhere, just to be seen! The title pinpoints exactly where this action takes place (so good that Pina named it twice) and though it may not always be obviously about the deep south of Italy, anyone with any knowledge of the region will see that it really is. The main action surrounds three women and one man. The first is introduced to us immediately after the wall falls down. She (Julie Shanahan) is the ‘self-hating woman’ who demands that the men hug her and kiss her and then asks them to pelt her with rotten tomatoes. Later, she wears a stocking over her face and stalks a male character, while she holds a revolver. Then there is the ‘grief-stricken widow’ and the one who wets her lips, dabs them with sugar and calls a man to kiss her. Underlying everything in Palermo Palermo is this essential need to be loved. Julie Shanahan in Palermo Palermo. The main man once again appears in the brooding presence of Bausch regular, Andrey Berezin, who seems to live in a boxer’s dressing room to the side of the stage. His presence is made all the more unsettling by a blackened eye and the fact that he appears to slice meat from his forearm before flash-frying it on an iron and eating his own flesh. And speaking of food, a big bone should be given to the clever dog that found its way across the rubble-strewn stage to eat the contents of a picnic and then, without a moment’s hesitation, hurried back off again. I read that all the dogs were procured locally and here is further proof that Britain’s certainly got talent in the canine department. Unlike some of her later work, where the greater dance content marginalises the opportunity to build momentum with her unique theatre of the absurd, there is never a dull moment in Palermo Palermo. The finale is a masterpiece in funereal, moving grief, with a typical Bausch processional march of folded, hanging movement, accompanied by the sound of bagpipes. Ordinarily this would bring the metaphorical curtain down but, this time, we are surprised by an epilogue in the form of a hope-affirming tale about geese outwitting a fox. It is an intimate moment that somehow catches the mood precisely. 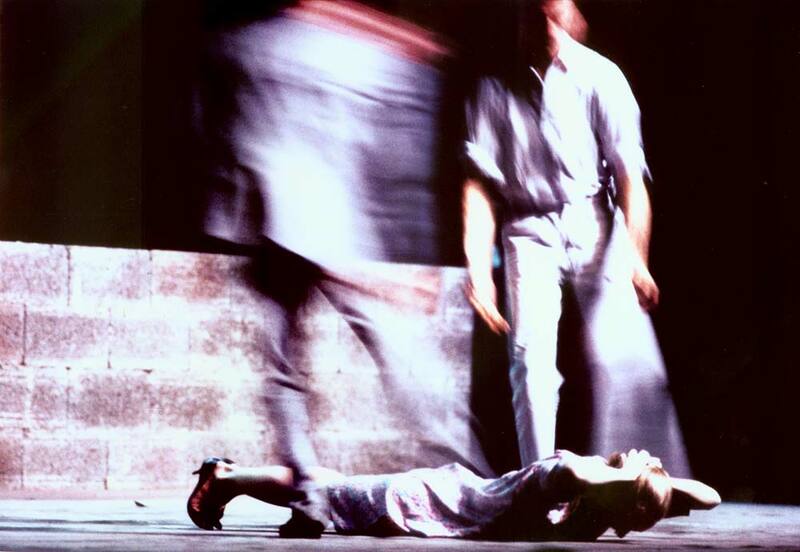 After the recent trio of later works in which cuts to the content would have greatly improved their enjoyment factor, the World Cities season has got right back on track with one of the very best works in the Bausch genre. Nine World Cities down, just one left. How I wish we could return to ‘go’.